Activate Worksheet is used to makes the current sheet as active sheet. Here we are using Activate method of worksheet object. It is very frequently used method while writing VBA macros. Why we need to Activate a Worksheet? When we need to use Activate Worksheet method in VBA? We use Activate worksheet method to activate current sheet as active sheet. When we are working with multiple sheets in a workbook, if we want to move or go to another sheet in the same workbook or another workbook we use activate worksheet method. Here is the example syntax to activate Worksheet using VBA. You can use either a Worksheet name or Worksheet number. Always best practice is to use sheet name. 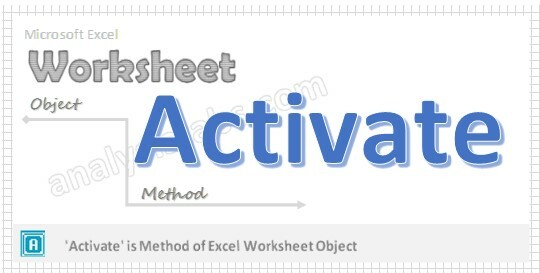 Where Activate is the method of Workbook object is used to makes current sheet as active sheet. Please see the below VBA codes to activate Worksheet. In this example we are activating a Worksheet named “Project1”. Please see the below VBA code or macro procedure to activate Worksheet. In this example we are activating first Worksheet in the active workbook. Note: Always better to use the Worksheet name, instead of Worksheet number. The best is to assign the Worksheet to an object and then do whatever task you want to do with that particular Worksheet object. When working with multiple Worksheets, you should refer the Worksheet with exact Worksheet name to correctly update your data into target Worksheet. Create Worksheet object and refer the Worksheet with the object whenever you require. Let us see another example to understand the accessing the Worksheets using objects. You do not need to activate Worksheet to deal with any Worksheet. Press ‘F5’ to run it or Keep Pressing ‘F8’ to debug the code line by line and check how the sheet is activating.